Alligator Jaws Pastry are an amazing triangle-shaped glazed pastry filled with delicious cherry buttercream frosting. You know this recipe is calling you! Alligator Jaws were my #1 favorite pastry when I was growing up. Hands down. In the small town where we grew up there was an amazing little bakery just off of Main Street called Ron & Chris Bakery. We all loved going there for donuts, cookies, and freshly made sandwiches. Their cherry chocolate chip cookies, ribbon sandwiches, and strawberry cream cheese croissants were among our favorites, but Alligator Jaws were the absolute best! What are Alligator Jaws exactly? Allow me to enlighten you. 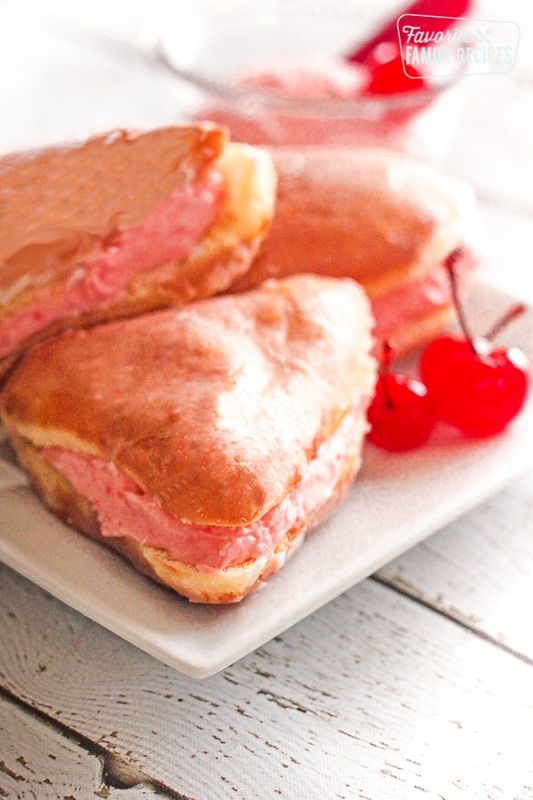 An Alligator Jaw is a triangle-shaped glazed pastry filled with a delicious cherry buttercream frosting. They are heavenly (super rich, but heavenly all the same). A few years ago I went to Cedar City, my hometown, with my heart set on getting an Alligator Jaw for old-times sake. To my dismay, the bakery was no longer open. I almost cried. Ok, I may have actually cried. The more I have looked, the more I have discovered that Alligator Jaws are one of those things that everyone in Cedar City knows about , but very few people outside of Cedar have even heard of them. It is the same with Ribbon Sandwiches. Who knew Cedar City had so many tasty foods that no one else has heard of? That being said, there is no recipe to be found anywhere out there for Alligator Jaws. UNTIL NOW! I couldn’t go one more day without having an Alligator Jaw so I came up with my own recipe. Lucky for me, it tastes just like the original. To all my friends in Cedar City, here is our recipe for Alligator Jaws. Trust me, they taste just like the Ron & Chris Bakery original. I know there is a grocery store in Cedar City that sells them, but these are better! To everyone else outside of Cedar City who has never heard of an Alligator Jaw pastry before, you are in luck! You don’t have to go on any longer wondering what an Alligator Jaw is or what it tastes like. You can see for yourself! I can’t even tell you how excited I am about this recipe! Not only do I love how delicious they are, I love the great memories they bring back from when I was a kid. I’m glad I can now share them with my family. This one is for you, Abby. Alligator Jaws Pastry is an amazing triangle-shaped glazed pastry filled with delicious cherry buttercream frosting. You know this recipe is calling you! Dissolve yeast in water in a mixer. In a separate bowl, combine milk, sugar, salt, eggs, shortening and add to yeast water. Slowly add flour and mix on low until dough is smooth and elastic. Cover with a clean dish towel and let it rise in a warm place until doubled, about 1 hour. Place on a cookie sheet allowing enough room to let them rise. They rise for about 30 min. Prepare glaze while rising (see below). Heat vegetable oil to 375 degrees. Slowly transfer the triangles with spatula to the hot oil and fry 30 seconds each side until lightly golden brown. Combine milk and vanilla in a medium saucepan and heat over low heat until warm. Sift confectioners' sugar into milk mixture. Whisk slowly, until well combined. Remove the glaze from the heat. Dip fried triangles into the glaze, 1 at a time, and set on a draining rack placed in a half sheet pan until cooled. In a food processor, process the cherries with the cherry juice (about 5 pulses). Place the processed cherries in a mixing bowl and combine with butter and about 1 c. powdered sugar. When well combined and smooth, add remaining powdered sugar a little at a time until you reach a good frosting consistency. Add more cherry juice if it gets too dry. Cut each triangle horizontally from the smallest point of the triangle to the back being careful not to cut it all the way through, making it look like an "alligator jaw". Open the "jaws" and spoon a good spoonful of frosting between each half and spread evenly. Place top half back down and serve. Thank you. I have been looking around for this recipe and had resigned myself to never having a suitable substitute (because the Linn’s ones aren’t the same). I will have to try it out! So true– the Lin’s ones are ok.. but they are no Ron & Chris! yeah ron and chris alligators were the best, we get ours at lins now! Sounds fun. My brother and his family lived by Delta, wonder if they ever happen upon them. Isn’t it crazy that Cedar has so many gems? The bakery, Pastry Pub, Don Miguel’s, RUSTY’s (their Coconut Shrimp is the best I have ever had)! So many great local places! Definitely, I have really missed Pastry Pub for sure! Oh my! I want to pull one off the screen and eat it! 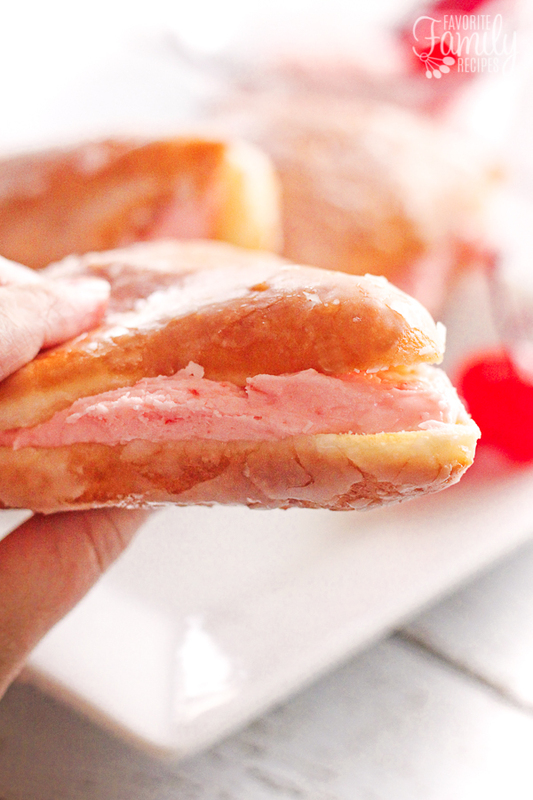 Frosting filled donuts of any kind are one of my “can’t pass it up” eats. That filling looks divine! I couldn’t agree more! I am a total “filled doughnut” girl! Loved these as a kid! Thank you! Now we just need cherry chip cookies! They were my absolute fav! ???? Right? The cherry chip cookies were awesome! Next on my list to figure out! Have you figured out a recipe for Ron’a brownies. So glad to have found this site via FB. Can’t wait to start trying them. Thanks for your efforts. Thanks Suzette! Glad you found us too! For the brownies… It has been so long since I have had them and the flavor isn’t as distinct as the alligator jaws, so I don’t have a duplicate. I will do my best to try though! We had these same Alligators in Richfield at Parsons Bakery. From when I can remember in the 70’s until they went out of business. They really are a special treat. They still sell them at Parson’s bakery in Bountiful! Do you happen to have the cherry chip cookie recipe? I miss those like crazy! I wish! The tough thing with those is finding the cherry chips. Those things are impossible to find! M husband bought me a case of them during the holidays, I have 1 bag left, n I hate cherry flavored anything! I love your site n all you share!! Thank you!! The case being cherry chips. THANK YOU! I have been dreaming about these for almost 40 years. I could not remeber where I had them but I have been hunting for them ever since. Trust me when I tell you that NO OTHER BAKERY ON EARTH has these! Thank you so much for the recipe! We grew up in St George and went to Neilsons Bakery and got these all he time. We also loved their donut holes! What cedar store still sells them? Thanks again! I too grew up in St. George and would get them at Neilson’s Bakery! We got such a kick out of seeing them for the first time and hearing their funny name. What a fun memory your post brought back! Yeah I have seen that too! I think that’s a cute idea. Yeah, they would do a star swirl on top and put a maraschino cherry in the middle for eyes. I LOVED those from Parson’s in Richfield! Haha yeah so true! That’s totally how my husband looked at me when I was trying to explain them! I just made them! They were amazing! There were two bakeries that I know of in Utah that made Alligator Jaws, Ron & Chris’ and Parsons Bakery in Richfield. They must have had the same recipe because both tasted the same. I LOVED both of those bakeries! Thank you for working to come up with a recipe. I can’t wait to try it! Unfortunately, it closed down several years ago. =( Like you, I cried when I went back home and they were gone. I’m a Cedar native as well and never realized that the these gems were so unique until I never could find them anywhere. So I decided to make these for the Super Bowl tonight. They turned out pretty good, and pretty authentic so I would say the recipe is pretty close to what I remember. I would post a picture of how mine turned out if I could. Thank you so much for this comment! Great idea to make them for the super bowl! If you want to post a picture you can post it on Instagram and use the hashtag #favoritefamilyrecipes — we would love to see it! Or you can email it to us and we can post it on our Instagram. I was so excited to see this recipe!!! I too loved the alligator jaws & cherry chip cookies from Ron & Chris! Our next-door neighbors were his granddaughters so once in a while we got to go in there and hang out with them at his bakery ! I served his Ribbon sandwiches as part of the refreshment for my wedding reception! So, I made this recipe tonight. Pretty darn delicious!!! It was so fun to be able to share this with my kids! I’m excited to try the ribbon sandwiches. Thanks again ???? Yay!!! So glad that you liked it! Thank you for coming back and leaving a comment to let us know! You are going to love the ribbon sandwiches. My kiddos gobble them up. OMG, both my sisters and myself and my brothers ate these as kids in Sunnyside, WA. in the 50’s and 60’s. We have search high and low for them since. We are planning a alligator jaw baking day party! THANK YOU, THANK YOU, THANK YOU!! Glad you found this recipe! You are very welcome! Let me know what you think! Back in the 50’s at the Holland Bakery in Sunnyside, WA they also had Alligator Jaws, but instead of the glaze they were dusted with powdered sugar and the filling was made up like a marshmallow frosting (but shiny-like a 7 min. frosting-but didn’t harden). I loved them! When I went back to Sunnyside in the early 70’s the owner had retired and the Alligator Jaws that was sold wasn’t anything like the original!! What a bummer! I’m so glad to have found this recipe. Maybe one day I’ll try to duplicate the filling they used. At least I have the pastry recipe. Thanks! Let us know what you think if you make them! Thanks for taking the time to comment! These look like Cheese Pockets that a local bakery here makes, except of course the filling is a sweet creamy (bakery?) cheese. Did the same restaurant/bakery that you used to get these from have anything like that? I honestly don’t think they had them filled with cheese but that sounds delicious. Almost reminds me of the cream cheese filled pretzels at Disneyland. Those are SOOOO good and the filling is slightly sweet, even though it is cheese. They are amazing! We had to start making them because we couldn’t buy them anymore. My grandparets owned a bakery in St. George and they made alligator jaws! I was just telling my husband that they were my very favorite thing to get when we went to Grandpa’s bakery, and I’ve never seen them again anywhere else! So my husband got online and found this! I’m so excited to try these, and that someone else on the planet knows about alligator jaws!!! Must just be a So. Utah thing! Aren’t they the BEST?? Dicks grocery store in Bountiful also makes them. They are not as good as Ron & Chris’s but they are close. Dicks also makes a version that has a custard filling mixed with a butter cream frosting. They were really good. Erika my son is a current resident of Cedar City and I want him to try the alligator jaws. Can you tell me where to tell him to go to buy some? I will be trying your recipe. They sound delicious! Hi Andy– you can still find them at Lins grocery store as far as I know! Thank you so much for this comment! I am so excited for you to try this recipe! Thanks for the heads-up about the splash of almond, we will have to try that next time. That totally makes sense! We loved Ron and Chris Bakery and we all have so many fond memories of it. Such a great place! What years did you work there? I’m a native of Cedar City now living in Arizona. I may have missed this, but what size pan did you use for frying and approximately how much oil do you use?